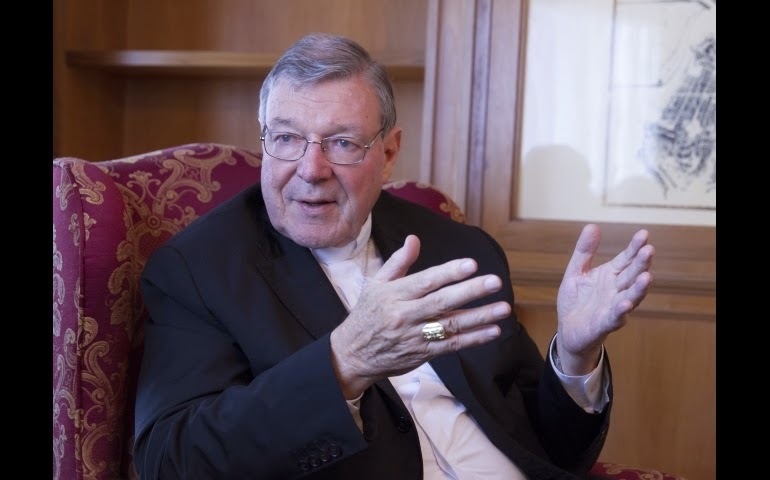 In an act of incredible audacity, the former "Cardinal-Archbishop" of Sydney, Australia, Mr. George Pell said the Vatican II sect was no more responsible for cases of child abuse carried out by church figures than a trucking company would be if it employed a driver who molested women. 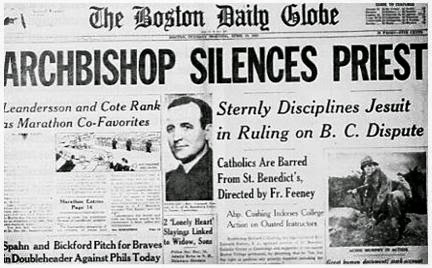 Those who were sexually abused by the Vatican II clergy reacted with righteous anger at his comments. Mr. Pell is as ignorant of civil and international law as he is of Divine and Canon Law (not to mention general principles of Moral Theology). Under the English common law (adopted, so to speak, in the U.S. and Australia) there is the legal doctrine of respondeat superior, i.e., "let the master answer." This occurs when an employee, acting within the scope of his employment, commits a tort or criminal act against a third party. The injured party can bring legal action against BOTH the employee and the employer, who is held responsible by vicarious liability. 1.Was the act committed within the time and space limits of the employment? 2. Was the offense incidental to, or of the same general nature as, the responsibilities the employee is authorized to perform? 3. Was the employee motivated to any degree to benefit the employer by committing the act? Did the employer take reasonable care to ensure the employee was fit for the job (e.g. criminal background check, no history of mental illness, etc)? Let's see how these apply to Mr. Bergoglio's sect. As to question #1, a priest is "on duty" 24/7, so the answer is yes. As to question #2, the molestations were incidental to the priest's duties (if Vatican II sect "priests" can be said to have any real "duties"). As to question #3, there can be said to be a mutual benefit of the sodomite perverts covering for one another--the so-called "gay mafia." Did the Vatican II sect take reasonable care to ensure the seminarian was fit for the job, the answer is a resounding "NO"! Forgetting the act of hiding these perverts AFTER their crimes are known, the sect has allowed men morally unfit for duty into their ranks. The homosexual was created by God as such. Since God is responsible for making the person this way, it is a gift to be a homosexual. My response: There is no definitive answer as to whether or not homosexuals are genetically determined, and even if they were it wouldn't matter. If alcoholism is determined to be genetic, will he tell the drunk that God is responsible for this so keep on drinking? Through the testimony of their suffering, God has chosen homosexuals to reveal something about Him that heterosexuals do not. My response: Reveal that "the wages of sin is death" perhaps? Those with bipolar disorder suffer too. Should they be ordained as well? God has called many homosexual men to the priesthood and episcopate. My response: And he knows this...how? God calls no one who is unfit to the priesthood. Least of all those who practice one of the Four Sins Crying To Heaven For Vengeance. Homosexual priests have an exceptional ability to proclaim the truth. My response: Unless the truth he is proclaiming is that "I'm disordered, and celibate," he has no special ability for proclaiming truth. This is a propositional statement devoid of any/all proof. Homosexual priests have more compassion than many heterosexual priests. My response: Another gratuitous assertion with nothing to back it up. To summarize, if a trucking company hired a driver who had a mental/moral disorder that made him violent towards women, and he raped someone, the company would certainly be on the hook! Add to that fiasco the hiding of the criminal once his acts are known, and the president of that company (and anyone else involved) should be locked up, and the key thrown away. Mr. Pell, and the rest of the Vatican II sect, have not come to grips with the fact that "gay is NOT OK" and you SHOULD judge them unfit (hear that Jorge?). The judgement to which someday THEY will be held liable, is neither civil nor criminal, but eternal---in the flames of Hell. On December 7, 1977, Eldon McCorkhill (age 33) and Linda Cummings (age 28) were having drinks at a bar in Redlands, California. Their conversation eventually came to the subject of life after death. Cummings said she was firmly convinced that reincarnation was true. A spirited debate ensued, as McCorkhill was not a believer in cycles of birth, death, and rebirth. They argued all the way back to McCorkhill's apartment; once there, he took out a loaded gun and handed it to Cummings, saying, "If you believe in this, let's see what you'll come back as." Linda Cummings took the gun, pointed it at her head, and without hesitation, pulled the trigger. (See San Francisco Examiner, December 8, 1977). Ideas have consequences. The True Church of Christ has always taught--along with the Apostle St. Paul---"(Just as)people are destined to die once, and after that to face judgment" (See Hebrews 9:27). The popularity of reincarnation and Eastern Mysticism is rampant in the Vatican II sect, with many "priests" and loony "nuns" practicing yoga, un-Catholic forms of meditation, and "centering prayer," all of which is opposed to authentic Catholic teaching. Earlier this year, Professor Deborah Raiees-Dana of John Brown University wrote an article for the student newspaper in which she stated "My story is too long and complex to explain fully, but I was saved while in elementary school, experimented with witchcraft in junior high, started drugs in high school and was deeply involved with the New Age—including yoga—during my college years. About 30 years ago I turned back to Jesus. About 20 years ago I began the process of being delivered from numerous demonic spirits." The article titled "Rethink Yoga" by Raiees-Dana, who is described as “the tutoring coordinator for Student Support Services”, wrote, "This column is not a theological exegesis, but rather a heartfelt cry. I understand that yoga has become an accepted part of the American culture. The National Institute of Health promotes it vigorously and much of the Church has accepted it as harmless. I have to disagree.As I have been thinking of all the arguments and reasons why yoga is not as beneficial as we've been led to believe, it all keeps coming back to the fact that yoga has its roots in the worship of demonic Hindu gods.I believe that while yoga may offer some benefits, those benefits have hidden, demonic strings attached. I spoke to one of our chapel speakers years ago about this. He was a Dalit “untouchable” from India who had become a Christian. His view is that yoga is the beautiful face that the very ugly religion of Hinduism uses to sell itself to Americans." It further says: "There is more I have left unsaid than I have said." The professor, while not Traditionalist, hit the nail on the head regarding Hinduism. It's "gods" are grotesque demons, and yoga type meditation opens the doorway to possession, (As expected, the PC crowd roundly denounced the professor-- and the nominally Christian University, rather than have someone write a rebuttal article---chose censorship by pulling her writing). "Thus in Hinduism, men contemplate the divine mystery and express it through an unspent fruitfulness of myths and through searching philosophical inquiry. They seek release from the anguish of our human condition through ascetical practices or deep meditation or a loving, trusting flight toward God." This is a false representation because it leads the Catholic to see Hindu mythology and philosophy as valid, as if they might effectively "search for" the "divine mystery," and as if Hindu asceticism and meditation bring about something similar to Christian asceticism. Add to this the doctrine of reincarnation, a particularly perverse idea. Reincarnation was explicitly condemned in the schema of the Dogmatic Constitution De Deposito Fidel Pure Custodiendo, which was elaborated during the preparatory phrase of the Council. Antipope John XXIII and the Modernists saw to it that it was rejected during the Council because of its paucity of "ecumenical" character.
" Yeah! Literally, it's like possession ‑ all of a sudden you're in, and because it's in front of a live audience, you just get this energy that just starts going…But there's also that thing ‑ it is possession. In the old days you'd be burned for it…But there is something empowering about it. I mean, it is a place where you are totally ‑ it is Dr. Jekyll and Mr. Hyde, where you really can become this other force. Maybe that's why I don't need to play evil characters [in movies], 'cause sometimes onstage you can cross that line and come back. Clubs are a weird kind of petri dish environment. I mean, that's where people can get as dark as they can in comedy ‑ in the name of comedy, be talking about outrageous stuff and somehow come out the other side. I mean, that's one place where you really want to push it” (Robin Williams, "Robin Williams,” by James Kaplan, US Weekly, January, 1999, p. 53). It was in Williams’ stand-up where he would go into his manic, stream-of-consciousness rants filled with vulgar language, perverse sexuality and the glorification of illicit drugs and drunkenness. Many people express shock after seeing Williams' stand-up, not knowing his act was so perverse. In 1998, Williams starred in a movie entitled What Dreams May Come. Williams' character, Chris Nielson, dies in a car accident four years after losing his two children. In one scene, Neilson awakens to find himself in the afterlife, which is both beautiful and unexpected. In the afterlife he is reunited with his dog and at first confuses his surroundings for "dog heaven." As he continues exploring the afterlife and coming to terms with his death, however, Nielson takes ownership of the situation. "Maybe I'm not in your heaven after all, girl," he says. "Maybe you're in mine." In an interview, Williams discussed the movie's ending in which (after getting his wife out of Hell for committing suicide!) Nielson and his wife choose to reincarnate and live out their lives together again. Williams said he favored an alternate ending that depicted reincarnation as a mandatory and natural cycle of life -- one which saves them from reliving their previous lives. He said, "There was a different ending that they shot that I felt was much more true to the story. It was about reincarnation, basically, that they were going to meet again. The movie ended with two babies being born simultaneously, one in Bombay and one in the United States, and they held them up, and then the screen went to black. I don't know if it's anywhere." 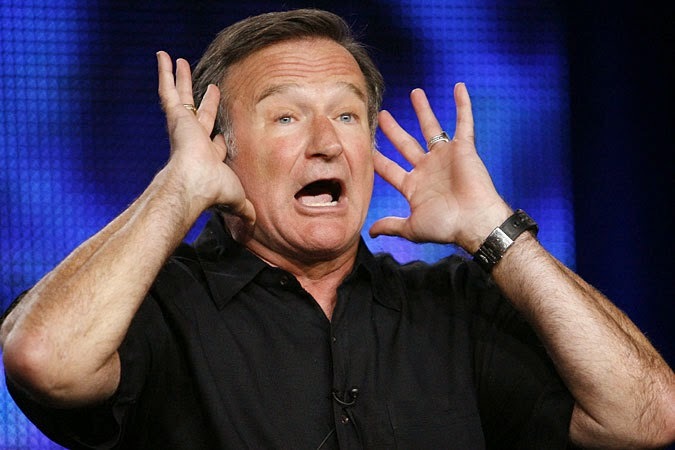 Robin Williams, a man who made many people laugh, was crying on the inside. He had opened himself up to demonic forces years ago that lead to his stardom. It also led to the corruption of souls along the way with his perversity and glorification of the evil doctrine of reincarnation. The True Church wanted to issue a formal condemnation of this teaching, but the Vatican II sect was spawned and glamorized the demonic "gods" of Hinduism. Poor Mr. Williams was lead to the ultimate despair and took his life. Unlike his movie, there will be no dogs in Heaven, and no release from Hell for those who die without sanctifying grace. Only Christ and His One True Church can save us, so please get it right the first and only time we have on this Earth. I am going to make a final attempt to answer the rabid Feeneyites--or Neo-Feeneyites-- who go farther than Feeney himself in their denial of Baptism of Desire (BOD) and Baptism of Blood (BOB). This will be my last word on the topic for awhile. Two of my readers who left comments on my prior posts (George R and Vox Clamantis) are beholden to the Neo-Feeneyite heresy. I will deal with Vox first. His comments will be followed by my response in red. I apologize in advance that some of Vox's comments come with parts that are not visible in my mail, however we can ascertain his arguments with ease. He is responding to my last post of August 6, 2014. This is contains an argument from probability, a false trilemma and a false argument from authority. Simply because a great number of studied people held a certain opinion doesn’t make that opinion true. Even Thomas Aquinas was ultimately overruled concerning the Immaculate Conception. And just because studied people are usually probably right doesn’t make them right. The point is that studied people are capable of erring (and no, it doesn’t make them heretics). I also don’t believe one of the options must be that Trent taught something ambiguous or heretical. I think it’s very clear that explicit desire for baptism *and* the actual reception of Baptism are necessary for salvation. The meaning couldn't be more clear. There is one thing very clear Vox: you don't understand, nor will you accept Church teaching even when it is clearly spelled out for you. 1. Catholics are bound to believe the teachings of the universal and Ordinary Magisterium of the Church. solemn pronouncement or IN HER ORDINARY AND UNIVERSAL TEACHING POWER [magisterium], to be believed as divinely revealed.” Vatican Council I, Dogmatic Constitution on the Faith (1870), DZ 1792. 2. What comprises the teaching of the universal and Ordinary Magisterium? According to theologian Ott: The promulgation by the Church (of dogma)may be made either in an extraordinary manner through a solemn decision of faith made by the Pope or a General Council (Iudicium solemne) or through the ordinary and general teaching power of the Church (Magisterium ordinarium et universale). The latter may be found easily in the catechisms issued by the Bishops." (See Ott, Fundamentals of Catholic Dogma, TAN reprint from 1955, pg. 4--Emphasis mine). According to theologian Van Noort: "Clearly if a truth is capable of being declared an object of divine-catholic faith through the force of this ordinary and universal teaching, there is required such a proposal is unmistakably definitive........The major signs of such a proposal are these: that the truth be taught throughout the world in popular catechisms, or even more importantly, be taught by the universal and constant agreement of theologians as belonging to faith." (See Van Noort, Dogmatic Theology, Newman Press, 3:222, 1960--first emphasis in original; emphasis after ellipsis mine). Bishops teach the flock entrusted and subject to them by means of catechisms, by synodal directives, mandates , and in public sermons. If it is evident from these documents that some doctrine is being set forth universally as an object of faith, then nothing else is required for this doctrine to be accepted de fide. Bishops spread throughout the world, but with the Roman Pontiff forming one Corporate Body, are infallible when declaring a teaching on faith or morals." (See Tanquerey, Manual of Dogmatic Theology I:177, 1959--Emphasis in original). The universal and constant agreement of the theologians that something belongs to the faith is not a case of some "studied people" who can be wrong, nor is it a fallacious appeal to authority. It is HOW THE CHURCH TEACHES US FREE FROM ERROR. The same is held by all pre-Vatican II theologians, most notably Hermann, Dorsch, Schultes, Zubizaretta, Iragui, and Salaverri. In addition, the proposition that the Church could err in Her universal disciplinary Laws was condemned by Pope Pius VI (Auctorum Fidei), Pope Gregory XVI (Mirari Vos and Quo Graviora), Pope St. Pius X (Pascendi Domenici Gregis), and Pope Pius XII (Mystici Corporis). 4. BOD and BOB are taught by the universal and constant agreement of the theologians, pre-Vatican II catechisms, and the 1917 Code of Canon Law. And the "clincher:" The 1917 Code of Canon Law promulgated by Pope Benedict XV, and adhered to by Popes Pius XI and XII teaches in Canon 737: "Baptism, the gateway and foundation of the Sacraments, actually OR AT LEAST IN DESIRE is necessary for all for salvation." (Emphasis mine) This canon ends the debate on the Church's official interpretation of Canon 4 of the Council of Trent regarding the Sacraments in General. Further, canon 1239.2 of the 1917 Code teaches: "catechumens who through no fault of their own, die without Baptism, are to be treated as Baptized." (Emphasis mine). 5. Therefore BOD and BOB are taught by the universal and Ordinary Magisterium and MUST be believed by all who wish to remain Catholic. A Catholic who does not assent to the Ordinary Magisterium, but rejects it as "optional" and only adheres to ex catherda pronouncements, rejects Vatican I and is a heretic. So, Vox, your argument stands refuted. Aquinas wrote at a time when theologians were sharply divided as to whether Mary was conceived without sin or pre-sanctified. The Ordinary Magisterium had not declared it. Such is not the case with BOD and BOB. I'll continue with Vox's missive, just to show how obdurate modern day Neo-Feeneyites really are in their heresy. Vox: You said, concerning my assertion that all true justification begins, is increased, or is regained through the Sacraments: Be careful Vox! An Act of Perfect Contrition with the DESIRE for sacramental Confession will absolve a PERSON OUTSIDE the sacrament of Penance. If you deny this, you are a heretic. Vox, you have given my readership a perfect example of what happens when you take it upon yourself to be a substitute Magisterium who can interpret the "true meaning" of Trent or any other teaching. The theologians, under the guidance of the popes, keep the meanings of dogma the same as when the Church first pronounced them and understood them. If you think you can pick up a copy of Denziger and read through it to decide what it means for yourself, you are deluded. I'm a lawyer, do you really think you could pick up a legal document and understand it as I do (if you're not a lawyer)? We have a name for non-lawyers who try their own cases. In criminal law, we call them "convicts," and in civil law we call them "the losing party." Have a non-doctor try "diagnosing himself" and treating himself using "web md" and you'll probably end up calling him a "cadaver." Just as we must turn to lawyers for legal help to understand the law, and doctors to understand medicine, we must turn to the Church's Magisterium to understand our faith. To depend on ourselves leads us to become heretics, and in serious danger of losing our souls. Vox: So, the impossibility being spoken of is something that is only temporary, ie. the catechumen hasn't died before Baptism. I wouldn’t say that this is private, or that I’m being arrogant. I’m reading the text and assessing the meaning. That’s it. Let’s not call names, huh? You wrote: It contains heresy? Really? And YOU found it! How did the Church survive before Leonard Feeney, the so-called Dimond "Brothers", and Vox? The Catechism was APPROVED by St. Pius and was praised by his successors Popes Benedict XV, Pius XI, and Pius XII. This would make St. Pius X a heretic and he could not possibly have been either a pope or a saint! His approval would be all that's needed here to be a heretic, not his "PERSONAL scholarship." Calling names now, huh? I read the idea, realized that it contradicted authoritative statements by Leo XIII and Pius XI, and reacted accordingly. And that Pius X gave approval to a catechism with an erroneous idea inside doesn’t mean he’s a heretic. He could simply have trusted that his understudies wrote a good catechism, and simply signed it without reading. Can you give proof that a pope who calls for the publication of a book with an erroneous doctrine that he didn’t write, and maybe didn’t even read, is a heretic for that very reason? You're not being arrogant when you substitute your private opinion for that of the Church? Not only are you arrogant, you're spiritually blind! You CAN'T simply "read the text" and decide for yourself the meaning apart from what the Church has always taught. I didn't call names nor am I doing so now. Your arrogance and blindness to the Truth even lead you to deny the efficacy of perfect contrition outside confession to remit sin. Sad. Can I supply proof that a pope who approves a book with an erroneous doctrine, (that he maybe didn't read) is a heretic? As Sarah Pallin would say, "You betcha!" Teaching BOD and BOB, if not true, would be (according to you) going against the correctly assessed meaning of the infallible decrees of Trent on Baptism, and on various other ex cathedra pronouncements on the necessity of Church membership for salvation. He would, de facto, be teaching that those who are outside the Church are actually inside Her and capable of salvation. So, the greatest Anti-Modernist of the 20th century commissions a catechism to be written to guide souls to Heaven and he didn't bother to read it! Nor did Pope Benedict XV, Pope Pius XI, or Pope Pius XII who all allowed it to continue as a guide for Catholics to get to Heaven. It wouldn't matter even if true. So, if Pope Pius X allowed such a heresy to be propagated, he was a heretic and neither a pope nor a saint. I do admire the way you continually try to give him an out for what you consider heresy. Perhaps Vox is really Bp. Bernard Fellay. I'm afraid that the situation is objectively more complicated than you seem to think it is. True, BOD has on its side the consensus of theologians, the opinions of some great saints, the express teachings of some catechisms (along with the apparently implied teachings of others). Now normally I would say that is pretty decisive, and I would have no problem with assenting to it... but unfortunately this teaching is open to a whole bunch of objections... and these objections are based upon the express teachings of the popes. No, your objections are based on your ill-informed conceptions of what you think are the express teachings of the popes.
" This is answered simply enough: In water baptism you are united to the Body of the Church, and by BOD/BOB to the soul of the Church. " "For since the mystical body of Christ, in the same manner as His PHYSICAL body, is one, compacted and fitly joined together, it were foolish and out of place to say that the mystical body is made up of members which are disunited and scattered abroad: whosoever therefore is not united with the body is no member of it, neither is he in communion with Christ its head." See? According to Pius XI, those not united to the body are not in union with Christ. Evidently, being united only to the soul is not good enough. Not good enough for YOU George, and your private interpretation. Read the above which I've written carefully. The issue is easy. The Church has spoken, and you must submit or you're not Catholic. Pope Pius XI upheld canon law didn't he? The same canon law which teaches BOD and BOB. Now I've said it before, and I'll say it again: those who hold to BOB and BOD are NOT thereby heretics; for even if it's a false teaching (as I believe it is), there's so much confusion surrounding it, that anything short of an express papal condemnation of the doctrine will leave faithful Catholics susceptible to believing it. But neither can it be held that those who reject BOD are thereby heretics, even assuming that rejection is erroneous, for the simple reason I gave above -- that it's open to serious objections based of express papal teachings. You'll say it incorrectly. I have amply demonstrated above that BOD and BOB are taught by the universal and Ordinary Magisterium. It's clear as day, when you don't substitute your private judgement for the teaching of the Church. Those of us who accept it (BOD and BOB) are Catholics. Those who don't are heretics. Your "serious objections" are seriously flawed. Please read what I wrote and I'll be praying for your conversion. I know, and that's why *you* are a heretic and headed for perdition.Once you've had the correct teaching of the Church presented, you must submit. I'll be praying for your conversion too, and ask my readers to do the same. I've received more responses from my post "No Dimond In The Rough" (7/22/14), than any other in the four years I've been maintaining this blog. Few topics generate such controversy in Traditionalist circles as the discussion over Baptism of Blood (BOB) and Baptism of Desire (BOD). I have further comments I would like to respond to in this separate post, rather than make the comments to July 22 longer than the post itself. The main comments come from one calling himself "Vox Clamantis,"i.e., "The voice of one crying." I will post his comments below and respond in red font below. I would like the readers of this post to notice one overarching theme: The Feeneyites, like the Vatican II sect and the Society of St. Pius X (SSPX) must (a) de facto declare that all that was taught pre-Vatican II was defective/heretical/incomplete and/or (b) the popes (real or thought to be real) actually didn't mean what they said in order to make their novelties ( e.g. no BOD or BOB, sedevacantism isn't true) seem plausible. Vox: Sorry. Just passed by this topic randomly while perusing the internet. May I offer some commentary? A point that some believe refutes the absolute necessity of baptism for salvation is how the canon reads: “If any one saith…that, without [the sacraments], or without the desire thereof, men obtain of God, through faith alone, the grace of justification…let him be anathema.” This is understood by many to mean that sacraments or the desire thereof are two methods that bring justification. However, a contextual analysis will cast doubt on that notion. The phrase ‘and that, without them, or without the desire thereof’ is a translation of the original Latin: et sine eis aut eorum voto. ‘Sine’ is indeed correctly translated as ‘without’, but the ‘without’ meant by ‘sine’ means ‘lack’ or ‘lacking’ (http://www.latin-dictionary.org/sine). There are several ways among others that the term ‘without’ can mean. Here, the author--whose credentials in Latin are unknown---is about to embark on an analysis of a Latin word. Apparently, HE has more insight than all the pre-Vatican II theologians and popes who just didn't understand the Latin until Fr. Feeney and his followers came along. Vox: 1) ‘The people in the house felt a wind that came from without.’ This way of using ‘without’ bespeaks spatial relations. The wind did not originate within the house, so it came from outside, or without. 2) ‘You can’t get to London from New York without traveling by plane or by boat.’ This way of using ‘without’ bespeaks method. Since one can’t get to London except by using one of these two methods, one says that ‘without a plane or a boat’ one can’t get to London. A better way of articulating this meaning would be ‘You can’t get to London from New York except by plane or boat.’ Here, ‘without’ refers to a limitation of methods for achieving an end. One must use one or the other, but both are not needed. 3) ‘You can’t have a wedding without a bride or a groom’. Another way of articulating this phrase is: Lacking a bride or a groom, you can’t have a wedding. This way of using ‘without’ refers to the conditions for achieving something. Here, it is said that if one lacks either a bride or a groom, you can’t have a wedding. This is quite unlike the aforementioned use of ‘without’, which allows for multiple, though limited, methods of achieving an end. It is perfectly sensible to say that one can get to London from New York with either a plane or a boat, but not both or by any other method. It would be foolish to say that one can have a wedding without a bride or a groom, that is, with only the bride, but no groom, or vice versa. If both conditions are not met then one cannot have a wedding. I assert that the term ‘without’ (sine) used in that canon from Trent provides the 3rd meaning explained above. As we can see through the definition of the word ‘sine’ and the syntax of the sentence stating the doctrine, the relevant part of the phrase reads: without [that is, lacking] x or without [that is, lacking] y. I assert that a more accurate reading of the text explains that, lacking the one condition (the sacrament itself) or lacking the other condition (the desire for the sacrament), justification will not take place. Some might suggest that this is sophistic word-twisting to accommodate my predilection. A few months ago, I wouldn't have disagreed. But a further investigation of authoritative documents will dispel that doubt. This is the typical Feeneyite ploy: you must have BOTH the sacrament and the desire of the said sacrament for validity, This was not the understanding of the Ordinary and Universal Magisterium, to which we must submit. It must be noted that desire is NOT all that is needed for adults in the reception of the Sacraments. The Council should have stated "WITHOUT FAITH" not "DESIRE" because most Protestant baptisms are invalid for lack of intent to do what the Church does. The One True Church teaches that Baptism is for the remission of all sins (both original and actual) with the infusion of sanctifying grace and the bestowal of an indelible character on the soul. Since most Protestant ministers don't intend to do this, (and the recipients don't desire it for this is not what they have been taught and believe), it would be invalid both for lack of intention on the part of the minister, and an obex (invalidating impediment) on the part of the recipient. Therefore, just having a desire for baptism is not sufficient, you must know what you desire(at least implicitly), for if you don't intend to receive the sacrament, it is invalid. So, either the interpretation given by such theological giants as St. Alphonsus Liguori is correct regarding Trent and BOD, or the Council of Trent actually taught something ambiguous (at best), or heretical (at worst) and all the theologians with their papally-approved teachings didn't understand. Vox writes about "authoritative documents" but gives no citations at this point. Yes, and this citation does not rule out the extraordinary way one can be saved with sanctifying grace. God so created us that we need food to survive (normally), but in certain instances, saints have lived on just the Eucharist for many years (miraculous). This doesn't mean we should depend on a miracle and not eat, but God can do it if He wishes. Be careful Vox! An Act of Perfect Contrition with the DESIRE for sacramental Confession will absolve a person OUTSIDE the sacrament of Penance. If you deny this, you are a heretic. A description is introduced of the Justification of the impious, and of the Manner thereof under the law of grace. By which words, a description of the Justification of the impious is indicated,-as being a translation, from that state wherein man is born a child of the first Adam, to the state of grace, and of the adoption of the sons of God, through the second Adam, Jesus Christ, our Saviour. And this translation, since the promulgation of the Gospel, cannot be effected, without [sine] the laver of regeneration, or the desire thereof, as it is written; unless a man be born again of water and the Holy Ghost, he cannot enter into the Kingdom of God. What the justification of the impious is, and what are the causes thereof. This disposition, or preparation, is followed by Justification itself, which is not remission of sins merely, but also the sanctification and renewal of the inward man, through the voluntary reception of the grace, and of the gifts, whereby man of unjust becomes just, and of an enemy a friend, that so he may be an heir according to hope of life everlasting. Yes, and none of this is at odds with BOD as explained above! Vox: Identifying the Sacrament of Baptism as the instrumental cause of justification is key. What does it mean to say something is an instrumental cause? An instrumental cause is “a cause that does not begin an action but is applied and directed as a help to its efforts and purpose by the principal agent.” (Fr. John Hardon, Modern Catholic Dictionary) To understand this example, imagine a man, a stick, and a book. The man uses the stick to move the book. The man is the principal actor in the sequence, because it is his power that moves the book. The stick is the instrumental cause, because it is through the stick that the man applies his power to move the book. To say, then, that the Sacrament of Baptism is the instrumental cause of justification is to say that God as the principal agent uses the Sacrament of Baptism as His instrument to convey to the recipient His Justice by which a man is rendered just. After his discourse on instrumentality, he now tries to prove that only water Baptism (the sacrament properly so-called) will unite one to the Church, outside of which there is no salvation. This is answered simply enough: In water baptism you are united to the Body of the Church, and by BOD/BOB to the soul of the Church. Pope Leo XIII in Statis Cognitum clearly taught that the Church is made up of "visible and invisible elements" You can be united to one and not the other. A baptized man in mortal sin belongs to the Body of the Church but not the Soul, as he is a dead member devoid of sanctifying grace. Likewise, someone who receives BOD/BOB can be united to the Soul without perfecting union in the Body "in actu" as taught by Aquinas. Vox: You've said that all the pre-Vatican 2 Catechisms have taught BOD and BOB. I have two. So, the impossibility being spoken of is something that is only temporary, ie. the catechumen hasn't died before Baptism. Once again, Vox has a private interpretation that he thinks is correct, and all the theologians and catechisms got wrong! Arrogance on steroids is what propels the Fenneyites. It contains heresy? Really? And YOU found it! How did the Church survive before Leonard Feeney, the so-called Dimond "Brothers", and Vox? The Catechism was APPROVED by St. Pius and was praised by his successors Popes Benedict XV, Pius XI, and Pius XII. This would make St. Pius X a heretic and he could not possibly have been either a pope or a saint! His approval would be all that's needed here to be a heretic, not his "personal scholarship." Baloney. Pope Leo was arguing against those who reject the Church as a visible Body, and those that deny it is a Divine Institution. The Church is both human and divine (like Her Invisible Head), and has human's visibly bestowing God's invisible Grace. As I cited above, the encyclical actually works against his position. Nope. Once again, his private interpretation trumps over popes and saint-theologians! You mean Pope Pius XI, allowed the heretical catechism to be taught under his nose while allegedly "condemning" it? Please. In chapter one, the second question asks: Whom do you call a Christian Catholic man? The answer is: Him that has received the Sacrament of Baptism, whereby he is made a member of the Catholic Church, & does profess in heart, word, and deed, the wholesome doctrine of Jesus Christ & of the Catholic Church, and does not consent nor agree to any strange sects, or opinions, that the Catholic Church does disavow or condemn. So, the members of the Church are those that have received the Sacrament of Baptism. The citation takes us to a catechism of the late 1500s and simply doesn't mention BOB and BOD. It was short and concise on the SACRAMENTS. BOB and BOD are NOT sacraments and so were not touched upon. The same catechism makes clear that sins after Baptism can ONLY be forgiven in the Sacrament of Penance without mentioning an Act of Perfect Contrition which is not a sacrament and can do the same. So members of the Church are those who have received Sanctifying Grace via Baptism or BOB/BOD as taught by the universal and Ordinary Magisterium to which all Traditionalist Catholics MUST submit. Notice how hard the Feeneyites try to make their "square doctrine" fit in the "round hole" of what was always taught? Just like the SSPX, popes approve of heresy, yet remain popes and even saints. Just like the Vatican II sect, where "spin is in" and novel doctrines are taught which had always been condemned, but there is "continuity in Faith." Well and good, argue about theological speculations until the cows come home, or until a real pope issues a solemn definition. Meanwhile back at the ranch, where are the conversions? How many people are you bringing into the Church, calling a priest for the sick, handing out scapulars and rosaries, catechizing on the street, inviting to your home for discussions? Why is your Protestant neighbor or co-worker not converted yet? Do you care? Don't you realize that talk is cheap in God's eyes? The harvest is great, but the workers are few. Hypocrites, all of you. Myself included. Don't be so hard on my readers, yourself, and me. What we are discussing is the Integral Catholic Faith--whole, entire, and inviolate--and to convert people to a falsehood, doesn't move them towards Heaven. This is not a discussion on how many angels can dance on the head of a pin. The point is well taken that conversions must be sought. I personally converted both my parents before their deaths. I also converted a long time friend from law school who now lives in the Southwest USA. He, in turn, converted both his parents, and his mom is still alive--going with him each Sunday to the Holy Sacrifice. So before issuing condemnations and name-calling, try and find out the facts. Conversions? Of course! But converted to what? The counterfeit Catholicism of Vatican II, the confused lunacy of the SSPX that wants to be both Catholic and non-Catholic, or the denial of a Truth of Faith in the teachings of Fr. Feeney? For those so concerned with belonging to the Church, make sure you know where to find it in these days of near universal apostasy first.